You are currently browsing the tag archive for the ‘christian community’ tag. Writing from Germany on the precipice of war, Dietrich Bonhoeffer wrote a classic on Christian community. In Life Together he called attention the grace of Christian community, calling it “the ‘roses and lilies’ of the Christian life” (21). In our country, where freedom to worship remains unchecked, his words provide a needed corrective to any laissez-faire attitude we may have towards biblical community. While church membership and attendance are generally affirmed by Christians, I don’t think we see how much grace there is in our ability to gather. By contrast, Bonhoeffer watched the Third Reich run over the church and the Church in turn to compromise with the state. In such a context, he came to see just how much grace there is when brothers dwell together in unity—true spiritual unity. Consider his words and give thanks for the community of believers he has given you. May his words spur us on to press deeper into the life of our church, or to start such a community of spiritually-minded believers, if one is not present. He introduces his book with the idea that Christian community is a profound gift, but one not experienced by all Christians alike. While adamant about the importance of Christian community, Bonhoeffer is no idealist. He makes it clear that the church is a place for sinners, warts and all. While Christ died to beautify his bride, that beauty is still forthcoming. What a strong antidote Bonhoeffer provides for Christians seeking self-satisfaction in the church. God aims for our eternal holiness, not our immediate comfort. from chapter 4 in Paul House, Bonhoeffer’s Seminary Vision. 1. Bonhoeffer believed that seminary is a time for students to learn how to lead a faithful Christian community. 3. Without Christ, students’ egos would keep them from loving one another. 4. But the greatest danger to Christian community is a wishful image. Only when all such images are broken, and disillusionment sets in, can the community begin to be what it should be in God’s sight. 5. Students did not always stay at Finkenvalde. Bonhoeffer himself wished to get away. People grumbled. The Confessing Church did not always live up to its promise. Visions of the future got crushed. Last Friday (April 9, 1945) was the 70th anniversary of the death of Dietrich Bonhoeffer. The German theologian and dissident, was hanged for opposing the Nazi regime. He is not just remembered for his death, but for his clear articulation of the incarnational faith, ministry, and community. Though never fancying myself as much of a theologian, I do enjoy the likes of activist theologians such as Lesslie Newbigen and Dietrich Bonhoeffer. You could say they had “street cred” in the neighborhood. They not only talked of God, they lived out the missio dei (the mission of God). An introspective question I often ponder is this, “Do I”? Or, am I simply a person who talks a good God game, but when it comes to living it out in my neighborhood, do I really? I hope I do…I pray I do…and even more so, I pray WE do! Let him who cannot be alone beware of community. He will only do harm to himself and to the community. 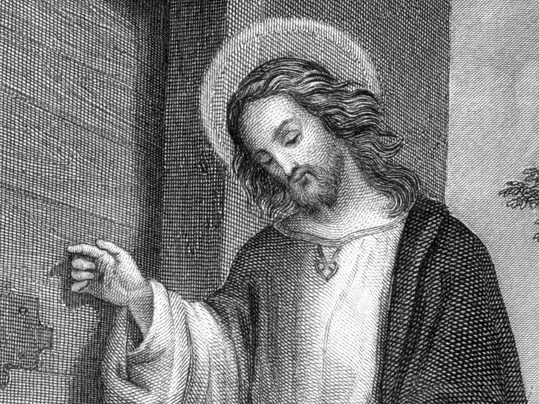 Alone you stood before God when he called you; alone you had to answer that call; alone you had to struggle and pray; and alone you will die and given an account to God. You cannot escape from yourself; for God has singled you out. If you refuse to be alone you are rejecting God’s call to you, and you can have no part in the community of those who are called. “The challenge of death comes to us all and no one can die for another. Everyone must fight his own battle with death by himself, alone…. I will not be with you then, nor you with me” (Luther). But the reverse is also true: Let him who is not in community beware of being alone. When we come together unified in corporate worship and small group settings, we affirm the “ministry of presence.” Not only do we seek the presence of God, which is primary, but we are drawn to the presence of each other. We can find words of wisdom on the theme of community and unity from two men from the past. E. Stanley Jones, lay missionary and evangelist, puts our need for each other this way: “Everyone who belongs to Christ belongs to everyone else who belongs to Christ. You do not have to seek for unity. You have it — in Christ.” We become brothers and sisters in Christ when we allow Christ to live in us. Dietrich Bonhoeffer, Lutheran priest martyred by the Nazis, suggests in his book, “Life Together,” that Christians have words from the Holy Spirit that need to be shared among them. These words may be convicting, encouraging or instructive, but they need to be shared. If we believe that Christ is the cornerstone of the “building” called the church, and if we believe that Christ is the head of the “body of believers” called the church, then the analogy that Jesus gives us in John 15:1-8 takes on a deeply personal meaning. When a branch is cut from a vine, it soon dies from lack of nourishment. Jesus says that can happen to the believer who fails to find nourishment in community with others and fails to stay connect to him. 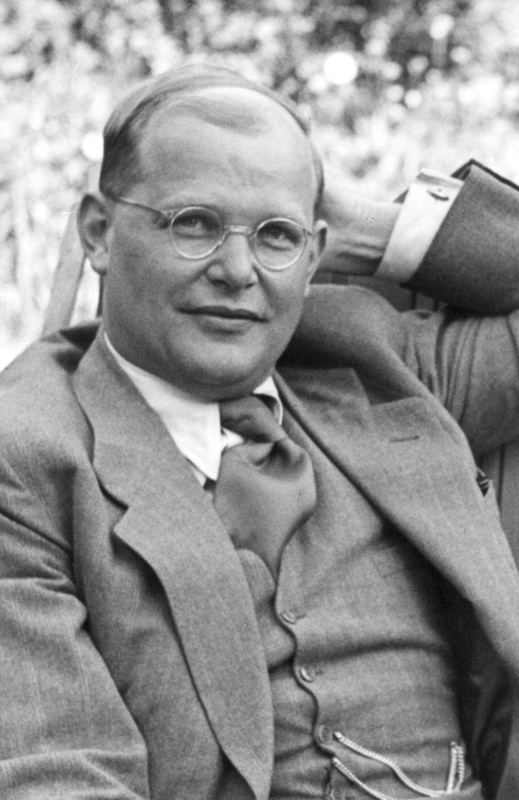 The German theologian Dietrich Bonhoeffer (1906-1945) had a major influence on post-World War II Protestant theology. Executed because of his part in the German resistance to Hitler, through his actions and writings he called for Christian involvement in the world. Dietrich Bonhoeffer was born on Feb. 4, 1906, in Breslau, the sixth of eight children. His father was a leading professor of neurology and psychiatry; his mother was the granddaughter of a distinguished church historian. When Dietrich was 6, his family moved to Berlin. He was educated at the universities of Tübingen (1923-1924) and Berlin, where he was awarded a doctorate in 1927 at the age of only 21. After a year as curate of a German-speaking congregation in Barcelona, Spain (1928-1929), Bonhoeffer spent the academic year 1930-1931 in the United States as Sloane fellow at Union Theological Seminary. In fall 1931 he became a lecturer in theology at Berlin University, and his inaugural dissertation was published that year asAct and Being. Two collections of his lectures were later published: Creation and Fall (1937), an interpretation of chapters 1-3 of Genesis; and Christ the Center, published posthumously from student notes. The latter work foreshadows the central idea of his last writings—Christ’s whole being is His being-for-man, and His powerlessness and humiliation for man’s sake are the fullest disclosure of the power and majesty of God. Bonhoeffer was one of the first German Protestants to see the demonic implications of Nazism. 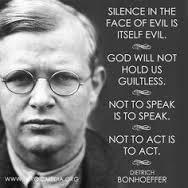 After Hitler came to power in 1933, Bonhoeffer helped organize the Pastors’ Emergency League, which became the nucleus of the Confessing Church of anti-Nazi German Protestants. While serving as minister to a German-speaking congregation in London (1933-1935), he sought support from international Christian leaders for the German Christians who were protesting Nazism. In 1935 Bonhoeffer returned to Germany and founded a clandestine seminary to train pastors for the illegal anti-Nazi church. The seminary, located chiefly at Finkenwalde, continued despite Gestapo harassment until 1937. Bonhoeffer organized the seminary as a living workshop in Christian community and developed close relationships with his students. Out of Finkenwalde came The Cost of Discipleship (1937), a clarion call to active obedience to Christ based on the Sermon on the Mount, and Life Together (1939), a brief study of the nature of Christian community. As war became increasingly inevitable, friends arranged an American lecture tour for Bonhoeffer with the hope that he would remain in the United States indefinitely. But only 6 weeks after his arrival in New York, he decided to return to Germany to suffer with his people. Bonhoeffer became a member of the German resistance movement, convinced after much soul searching that only by working for Germany’s defeat could he help save his country. From 1940 to 1943 Bonhoeffer worked on a study of Christian ethics, which was grounded in the biblical Christ as the concrete unity between God and the world. The sections he completed were later published as Ethics (1949). in a bunch of ordinary people. The great danger for young Christian adults is to love their own projections of what the ‘perfect church’ should be more than the church itself, argues Kim Beales. Inspired by the faith and insights of Dietrich Bonhoeffer, the German Pastor executed by Hitler, he urges young Christians to let go of their wish-dreams and embrace the reality. Around the world, the church craves insights for how best to engage, equip and mature young adult Christians. In my six years of work as a young adults’ pastor, I have come across one insight that outshone the rest. 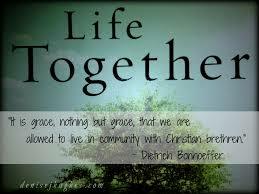 It comes from Dietrich Bonhoeffer’s brief yet immense book on community, Life Together. Young Adult Christians often have great dreams of Christian community. I have had the privilege of listening to many people’s hopes and dreams. Many young adults have a dream that the church will be a place of justice. These young adults seek out work with refugees and other marginalised people, and spend their free-time advocating on behalf of the poor. Others have the dream that the church will embrace prayer, walk closely with God and use charismatic gifts. They desire to be a part of a church that is alive, with a strong sense of the presence of God. Other young adults dream of an inclusive church: a community that overcomes boundaries of race, age, ability, wealth, and status. Prod a little further and one also discovers self-centred dreams: dreams of being part of a like-minded church, without the personalities that jar, and hope for a church that somehow eradicates any experience that might remotely create a feeling of awkwardness. Disillusionment with the church among young adults is rampant. A simple question cuts to the heart of this disillusionment: Does your dream of Christian community make you dissatisfied and disillusioned with the church? Those who are wonderful at working with refugees despair at others who fail to embody a strong social conscience. Those who love the gifts of the Spirit grow disillusioned with the lack of spiritual faith and expression in their community. Those who desire church to be ‘cool’ or stylishly acceptable are put off by the odd collection of folk the church attracts.